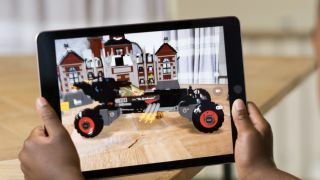 Apple is preparing a big push into augmented reality – that much is certain after the company revealed its ARKit plans at this year's WWDC developer conference. But could there be a big focus on AR gaming? A newly uncovered patent seems to suggest so. Patently Apple have found a patent application that describes a 3D camera system intended for augmented reality use. Developed by Apple's Israeli PrimseSense team, it looks to use a light beam for optical 3D mapping and depth sensing. "The orders of diffraction are reflected from a surface at multiple points, the reflected light from each of the multiple points is detected, and the reflected light is used to compute a depth map of the surface," says the Apple patent, which shows a prism-shaped optical deflector used to calculate the depth and distance. The camera system looks destined to allow for Minority Report-style hand gestures. With the depth-sensing camera potentially strapped to the front of a pair of Apple AR glasses, it would allow for interactions with a hovering holographic interface, just by moving your hands. "Such depth mapping may be applied to interactive video games. For example, a subject may interact with a game by making various gestures with his hand, and depth mapping may be used to identify the gestures." With a number of patent filings now noted, and with ARKit's unveiling letting developers get to grips with Apple's AR toolkit, the evidence towards a pair of Apple AR glasses seems to be mounting up.